Very good boys (and girls!) welcome at Dal AC gym. Dalhousie’s Agricultural Campus is giving dog owners the chance to get some exercise without being at the mercy of Old Man Winter. 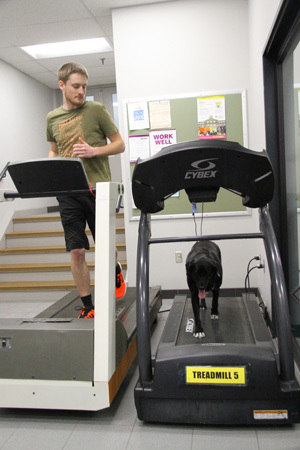 The Bible Hill campus has set up treadmills which can be used by dogs to run or walk next to their owners in the Langille Athletic Centre, giving both pooch and human the opportunity to stay active together over the winter months. “We wanted to try to expand our services to our members, students and drop-ins and we hope people can take advantage of it,” says Judy Smith, director of Athletic Services on the Agricultural Campus. The doggy treadmills will be offered to all students, members and drop-ins. Details of the program, such as hours of operation, are still being worked out but those interested can contact Langille Athletic Centre at 902-893-6660 or contact jonathan.wang@dal.ca for logistics. The campus recently received several new treadmills for its cardio area but, with space at a premium, had no more room for its older models. Rather then decommission the still good-working machines, Smith recalled seeing several students walking near the campus with their dogs and thought it would be a good idea to keep the older equipment running while giving dog owners the chance to exercise their pets in a safe, comfortable environment. Smith said she had discussed the idea with several students and the concept was well received.